Bangaloreans are waking up to the miracle of life, fighting filth with flowers, planting mini-forests and finding the answer to food safety in their terraces and backyards. 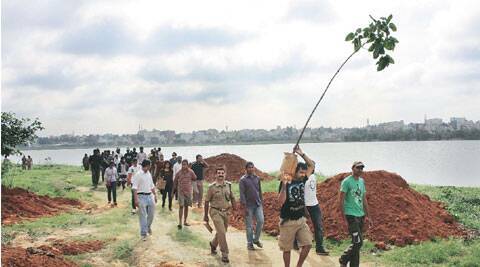 sustained effort Community tree planting by volunteers of Saytrees, a Bangalore-based NGO. On a cool February evening, flowers crowd my field of vision. A tropical trumpet vine dances with the wind, marigold and Himalayan balsam bask in the fading light, a nameless gangly bush shrivels when touched. It is a native mimosa, a cousin of the touch-me-not topped carelessly with circles of gold. This seemingly casual bouquet, spread over a hundred or so square feet, is in fact carefully and intimately curated. But without a legal claim on the land, it is something of a secret garden. Twenty-eight-year-old Ananth, who is as secretive as he is playful, is the architect of this unlikely landscape hidden behind the plastic-sheeted boundary wall of an empty plot in north Bangalore. “The plot is under litigation. For years, it was a dump, but a friend and I cleared a part of it last year and planted some native wildflowers,” says the software engineer. Ananth risks charges of trespass and vandalism by reclaiming disused land for gardening amid the asphalt jungle of the city. Every few weeks, he combs the forests around Bangalore for flower seeds and illicitly propagates them in the city at neglected street corners, government campuses, parks and empty plots. Desperate times call for desperate measures, reasons Ananth. “I don’t know what is worse — the concrete expanses or the islands of waste that come up between them. What the city needs is native vegetation,” he says. “In the next few months, I want to build a seed bank of hardy species from across Karnataka and incite citizens to throw them around town,” says Ananth. He is working on a blog and a Facebook page to jumpstart this movement. In the West, for several decades now, guerrilla gardening has turned derelict public spaces into green oases. In Bangalore, it couldn’t come at a more opportune time, for it joins the rising chorus of green movements that are gaining in tempo and flooding the streets with the promise of urban renewal. One recent Saturday afternoon, in the dappled shade of Cubbon Park, a 250-acre heritage green space in the heart of the city, hundreds of Bangaloreans swayed to harvest songs about picking gooseberry and danced hand-in-hand with nature-worshipping Soliga tribals from the Biligiri Rangana Hills. Neralu, meaning shade in Kannada, was Bangalore’s first major tree festival, crowd-funded and organised by botanists, artists, conservationists and storytellers in love with the city’s trees. As the history of Bangalore’s now-tattered green blanket unravelled — in vivid photographs and sketches, in shared memories of a fragrant champaka or a juicy jamun that scented and coloured many childhoods, in discourses on urban transformation and conservation — people watched with a pang of nostalgia. One thing became amply clear: they were all looking for restorative relationships with nature. Families bonded under the arches of the silk-cotton; professionals wrapped their heads around Bangalore’s biodiversity; children simply hugged the tree near them. With food safety no longer a marginal concern, there is growing appreciation for organic or pesticide-free farm-to-table bounty. Progressive food ethic, combined with space-and-effort-saving technology, are turning scores of barren terraces into lush vegetable patches. “You cannot attach enough value to the experience of growing your own food,” says P Manikandan, better known as the Geek Gardener, after his eponymous blog that has become Bangalore’s kitchen gardening bible. A former techie, he quit a year and a half ago to set up a garden store on popular demand. At the store, perched on a dusty street off Bannerghatta Road in south Bangalore, heirloom vegetable seeds, fertilisers, luxuriant heads of lettuce that seemingly grow on nothing but air and hydroponic equipment — in hydroponics, plants are not grown in soil but in water or inert solid media enriched with nutrients — fill the shelves. There was a time when gardeners had to lug heavy potting soil to the terrace and hope the roof did not give away. Now, with the ready availability of weightless growing media like cocopeat, perlite and vermiculite, soil is passé, Manikandan says. “There are two major reasons Bangaloreans are turning farmers. Pesticides are a major concern. And gardening is proving to be the perfect de-stressor for professionals,” he says. For many, the need to welcome their children into the green fold is a powerful impulse to start gardening, says Sriharsha, a 42-year-old acupuncturist from Arakere, a suburb in south Bangalore, whose rooftop greenhouse yields everything from 450-gram beefsteak tomatoes to Swiss chard. His six-year-old son Manas’s name is inked on some plant labels — chiefly radish — and he waters them with great joy. Children are often the most willing gardeners, says Rajani Mani, a filmmaker who launched a volunteer-driven community kitchen garden campaign called Eat Your Street in Whitefield last year. After spending a decade abroad, Mani returned to a changed Bangalore where food came from thousands of miles away and people had erected walls around themselves. An edible garden by the community, for the community, seemed like a good solution. Mani, along with her friends Lavanya Keshavamurthy and Dhanya Nishant, set about clearing a patch of orphaned public land to plant some corn as an experiment. It came up well — the cattle hadn’t eaten it and no one vandalised the garden — but the problem of ownership and community involvement remained. The team then began setting up low-maintenance edible gardens in government schools and apartment complexes, inviting residents to plant, water and harvest. “The response has been mixed. Kids are happy to tend to their patches but even in the common garden within my own apartment complex, people are reluctant to pluck and use the produce,” she says. But a year after she started off, she no longer feels like the odd one out, Mani says. “Inspired by our veggie patch, a neighbouring restaurant has now set up its own. It is a growing movement,” she says. Eat Your Street participates in eco-friendly fairs, where its seedbomb-making activities are immensely popular with children. Several simultaneous efforts are underway to help re-create magical landscapes from another time and place. Afforestt, a company that is in the business of planting and growing dense mini-forests in and around Bangalore, is a rare startup. The founder, Shubhendu Sharma, is trained in the Miyawaki technique, which involves planting indigenous trees close together and tending to them for the first few years so they quickly form a dense canopy, allowing native shrubs to thrive underneath. Patches planted by Afforestt in Whitefield and Nelamangala are now healthy ecosystems that attract birds and animals. Ironically, many of these green warriors have lived in Bangalore for less than a decade. Kapil Sharma, another passionate tree planter, has helped plant 8,000 trees across Bangalore through his NGO, Saytrees. An engineer with Impelsys, a digital publishing solutions company, Sharma set up Saytrees in 2007 when he saw huge numbers of trees being felled for Metro work and road widening projects. With increasing participation from volunteers and corporate support, Sharma and his four associates have scaled up rapidly in the past year, planting as many as 3,000 seedlings along Bangalore’s lakes and highways and in schools and parks. “We identify areas that are bereft of trees and get the required permissions from civic authorities before we plant.